"Mirare presents two pillars of the great Russian piano repertoire played by the fabulous Boris Berezovsky, currently receiving plaudits for his Chopin/Godowsky release for Warner Classics. 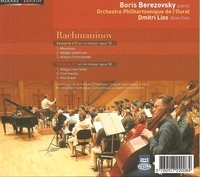 Accompanied by the Orchestre Philharmonique de l'Oural under the direction of Dmitri Liss, Berezovsky's stunning performances of these warhorse concertos will win over even the most jaded listener, and provide an excellent introduction to the sensitive virtuosity of this extraordinary pianist." "There are many factors that contribute to a great and worthwhile album; the actual performance (in this case by orchestra and soloist) is obviously important, but also significant is recorded sound quality, programming, interesting and informative liner notes, and (although less important) nice packaging doesn't hurt, either. This CD of Rachmaninov's "First" and "Fourth" piano concertos and the "Rhapsody on a Theme of Paganini" gives listeners all of these things. The liner notes provide an exceptionally useful timeline highlighting the chronology of two concertos, showing where revisions were made and when the final version emerged relative to the initial sketches. The Orchestre Philharmonique de l'Oural does a superb job of providing a lush and sensual backdrop for all three works heard here. The horn solos are quite lovely, the string playing sensitive and warm, and interplay between orchestra and soloist is always flowing and natural. Tchaikovsky Competition Gold Medal winner Boris Berezovsky is the brightest shining jewel of this album. His playing shifts deftly between elegant, flowing melodies; nimble and agile fast passages; and triumphant, powerful climaxes. The recorded sound is remarkably clear without becoming tinny. Truly, this recording has it all and would be a good addition to a larger collection as well as a fitting introduction to these works." “Berezovsky studied at the Moscow Conservatory with Eliso Wirsaladze and privately with Alexander Satz. Following his London début at the Wigmore Hall in 1988, THE TIMES described him as ‘an artist of exceptional promise, a player of dazzling virtuosity and formidable power’. In May 2005 he had his first solo recital in Théâtre des Champs-Élysées in Paris and played in the same venue in January 2006 with the Orchestre National de France. In January 2007 he played seven recitals ‘Carte Blanche’ in the Louvre. In May 2009, he premiered Karol Beffa's Piano concerto in Toulouse, with Orchestre National du Capitole de Toulouse and Tugan Sokhiev as conductor. He has initiated and organized the International Medtner Festival that took place 2006 and 2007 in Moscow, Yekaterinburg and Vladimir, as he has championed the composer since the early 1990s and has been one of the foremost recent interpreters of Medtner's music.